In a game for the ages, on February 1st, 2015, the New England Patriots, led by Tom Brady and Bill Belichick, took on the reigning champion Seattle Seahawks in Super Bowl XLIX. With time winding down in the final minute of this epic matchup and Seattle just a yard away from repeating as Super Bowl Champions, an undrafted rookie free agent, Malcolm Butler, jumped the route to wrangle Russell Wilson's pass away from the receiver and sent the Patriots to their fourth Super Bowl victory since 2001. An inventive, lyrical ode to creativity and an intimate examination of the artistic impulses of Australian-born musician and cultural icon Nick Cave. In their debut feature, directors Iain Forsyth and Jane Pollard fuse drama and documentary, weaving a staged day in Cave's life with never-before-seen verite observations of his creative cycle. 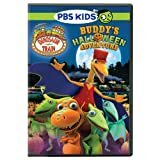 From visiting a haunted house for a spooky party, to learning about 'Gourd Day' - a kind of Mesozoic Halloween, this DVD, available prior to October 31, features fun-filled stories the entire family will enjoy! Buddy and his adoptive family of Pteranodons go on whimsical adventures through prehistoric jungles, swamps, volcanoes, and oceans as they unearth basic concepts in natural science, natural history, and paleontology. Kovacs, whose offbeat humor graced the airwaves for just a decade in the 1950s and 60s, served healthy portions of the offbeat to his audiences, who had never seen anything quite like this cigar-wielding charmer. Wickedly funny but not offensive, Kovacs' unique humor and flair for improvisation would ripple across generations, influencing TV funnymen from Johnny Carson, Monty Python and David Letterman to Jim Henson, Pee Wee Herman and Saturday Night Live. Brings to life the fascinating history of some of the most successful and beloved shows in television. Stars such as James Garner, William Shatner, Leonard Nimoy, Nichelle Nichols, Angie Dickinson, Bill Cosby, Robert Culp, Stefanie Powers, Martin Landau, Peter Graves, Robert Conrad, Linda Evans, Mike Connors, Fess Parker and writer Stephen J. Cannell are among those interviewed whose imprint on the iconic genres they helped create still impact the medium today.